Ministers had been set a deadline of today by Taoiesach Leo Varadkar for approving the National Broadband Plan (NBP) - but the project is not even on the agenda for the last Cabinet meeting before the Easter recess. With just one bidder left for the valuable tender, officials are undertaking what sources described as an "exceptional evaluation process" to ensure that the price paid for rolling out fibre broadband to more than 500,000 homes and businesses is appropriate. The final bill for the taxpayer is set to be many multiples of the original €500m predicted. It is believed the costs could mount to between €2bn and €3bn. Government sources said they are concerned that the NBP will be perceived as having runaway costs like the National Children's Hospital. As a result, the assessment of the tender bid is much more "invasive" than normal. 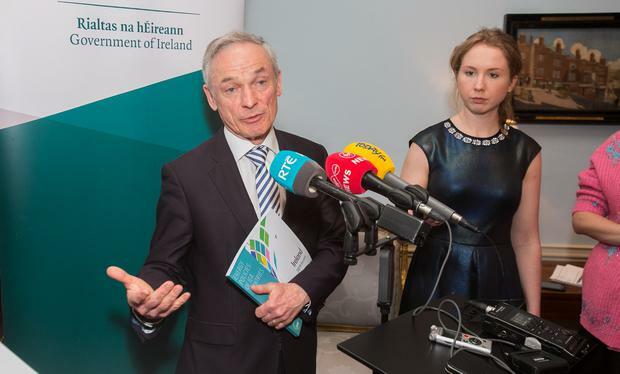 Communications Minister Richard Bruton said that "due diligence" is close to completion, but it's a "significant decision" and "time and space" is needed for it. However, the delay has been described as a "betrayal" and "farcical" by the Opposition. The NBP has been beset with delays and difficulties, including two bidders dropping out. National Broadband Ireland, a consortium led by US businessman David McCourt, is the only remaining bidder. Fianna Fáil communications spokesman Timmy Dooley has called on Mr Bruton to clarify when he intends to bring proposals for the NBP to Cabinet. He said that the minister had indicated last November that a recommendation would be brought "within weeks". He added: "Fast forward five months and there is still no movement - it is deeply frustrating." Mr Dooley also pointed to Mr Varadkar's target of Easter and claimed that the fresh delay is "a disgraceful betrayal of the people who have been waiting for so long and who depend on this roll-out". Sinn Féin's Brian Stanley hit out at what he called "the latest delay in an increasingly farcical process". He added: "The people of rural Ireland have waited long enough and I do not believe that this Fine Gael Government is treating this situation with the appropriate urgency and seriousness." A spokesperson for Mr Bruton declined to offer any time-line for when he will bring the NBP to Cabinet. The Department of Communications said that he will "bring a recommendation to Government shortly". Mr Bruton said there is "no intention to drag out this process". He said there was a "determination to reach a decision in a timely way, but it is an important decision and it is one that we're determined to get right". Tánaiste Simon Coveney last night insisted the NBP is "not on the long finger", but there was "some more work to do" before Mr Bruton could lay out proposals to Cabinet. Mr Coveney added: "We are not talking about months here, we are talking about weeks."